Join us for a celebration of carnivorous plants with over a dozen stations of games, crafts, and educational activities for the whole family (activities geared toward ages 5-11). 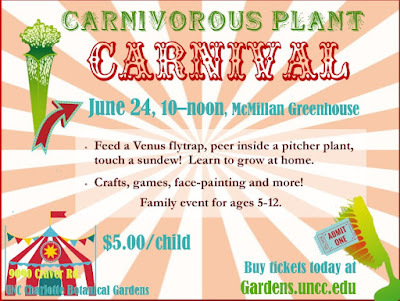 Venus flytraps, pitcher plants, and sundews will be available so you may bring the sideshow home. Explore these botanical wonders up-close, have fun, and let your imagination soar!